After spending a lot of time on breaking Time down into fractions it was no big surprise that my daughter wanted to do more fractions this week (Fractions is one of her favourite Maths topics). We had been talking a bit lately about decimals and percentages so I thought it might be fun to create our own home-made fraction, decimals and percentage poster. The idea really came from my daughters Fraction Towers (Learning Resources Fraction Tower Cubes Equivalency Set ). The fraction towers show the fraction on one side, the decimal number on another side and the percentage on a third side so I thought let’s do the same thing but with some home-made flaps. We started off by cutting some thick coloured craft paper that we have into fairly thick strips and then each strip was folded into three, creating two flaps. On each coloured flap my daughter wrote the fraction (she did this in the middle ) and then the decimal number on the first flap and the percentage on the second flap. Once she had written all the combinations we stuck them down onto a piece of A3 paper (while she was doing this she was constantly talking about the fractions and the decimals, finding patterns and noticing a few connections). Once all the flaps were stuck done she actually started testing herself. She turned all the flaps so that the decimal numbers were on top and then checked to see if she could remember the correct fraction for each decimal. We purposely chose different colours for each fraction as I know my daughter will find that helpful (the red flap is for 1 and the pink flap is for 0.5 – so when she remembers it she will recall what is written on the pink flap – it is just the way she remembers things). 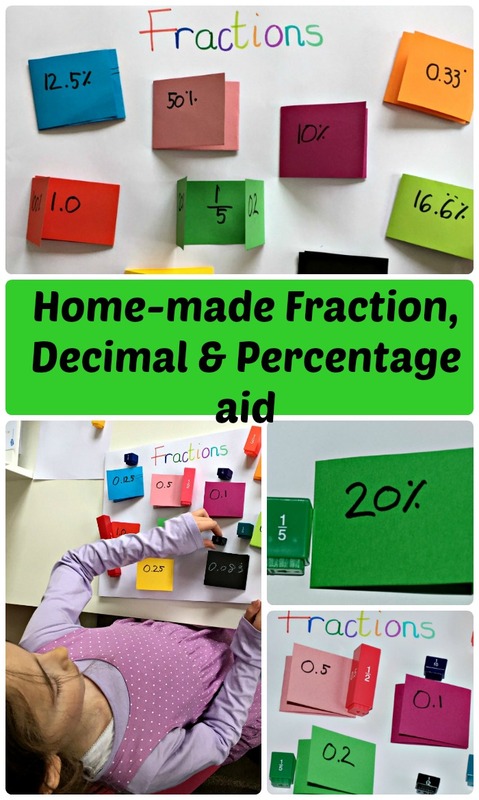 This entry was posted in maths ideas and tagged decimals and percentages, fractions, home education, home-made maths, homeschooling, Maths resources. Bookmark the permalink.